Dean E. Eastman was Emeritus Professor of Physics at the University of Chicago (1998-present). Other institutional affiliations included Argonne National Laboratory and International Business Machines Corporation (IBM). His research interests included solid state physics and condensed matter. January 21, 1940Birth, Oxford (Wis.). 1962Obtained BS, Massachusetts Institute of Technology (MIT), Cambridge (Mass.). 1963Obtained MS, Massachusetts Institute of Technology (MIT), Cambridge (Mass.). 1963 – 1996Researcher, Research Division (1963-1971); Manager, Photoemission and Surface Physics Group, Research Division (1971-1981); Manager, Lithography Packaging and Compound Semiconductor Technology (1981-1982); Director, Advanced Packaging Laboratory (1983-1985); Director, Product Development, Systems Technology Division (1986-1994); Vice President, Logic Memory and Packaging (1986-1994); Director, Product Development and Vice President, Systems Technology Division (1986-1994); and Director, Hardware Development and Re-engineering (1994-1996), International Business Machines Corporation (IBM), New York (N.Y.). 1965Obtained PhD in Electrical Engineering, Massachusetts Institute of Technology (MIT), Cambridge (Mass.). 1972 – 1973Visiting Professor, Massachusetts Institute of Technology (MIT). 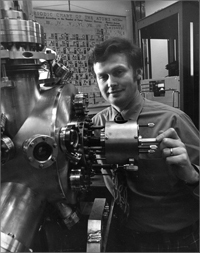 1980Awarded Oliver E. Buckley Condensed Matter Prize, American Physical Society. 1982Member, National Academy of Sciences. 1988Member, National Academy of Engineering. 1991Fellow, American Academy of Arts and Sciences. 1996 – 1998Director, Argonne National Laboratory. 1998 – presentProfessor to Emeritus Professor of Physics, James Franck Institute, University of Chicago. Both employed at University of Chicago, James Franck Institute. Researcher, Research Division; Manager, Photoemission and Surface Physics Group, Research Division; Manager, Lithography Packaging and Compound Semiconductor Technology; Director, Advanced Packaging Laboratory; Director, Product Development, Systems Technology Division; Vice President, Logic Memory and Packaging; Director, Product Development and Vice President, Systems Technology Division; and Director, Hardware Development and Re-engineering. Obtained BS (1962), MS (1963), and PhD (1965) in Electrical Engineering. Visiting Professor. Professor to Emeritus Professor of Physics. Fellow and Awarded Oliver E. Buckley Condensed Matter Prize.